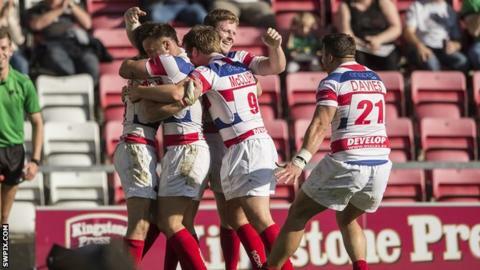 Rochdale Hornets chairman Mark Wynn is convinced that the Rugby League World Cup will have a lasting legacy. And Rochdale, who will play in the Championship next season after winning promotion, are seeing an impact. "We've already sold more season tickets than we did for the whole of last year, and we're still three months away from the start of the season," said Wynn. He told BBC Radio Manchester: "You can almost feel that there's an atmosphere now around the Hornets. "Obviously we had some success last year, but the World Cup has certainly enhanced that. People are stopping you on the street wanting to talk rugby league." Rochdale Hornets played a friendly match against Fiji prior to the World Cup. Fiji won 78-0. Spotland also hosted their first group match of the tournament against Ireland, which Fiji won 32-14. More than 45,000 were at the Millennium Stadium in Cardiff for the World Cup's opening fixture between England and Australia on 26 October, while 67,000 people watched the semi-final double-header at Wembley last weekend. Saturday's final between Australia and holders New Zealand at Old Trafford was announced as a sell-out. Even at smaller venues such as Workington, Bristol and Rochdale - which against Ireland - stadiums were either sold out or close to capacity. In his BBC Sport column, Leeds Rhinos prop Jamie Peacock and is desperate to see the authorities capitalise on the added interest in the sport. "This has been a brilliant tournament, one that has exceeded all expectations," said the former England captain. "If you'd have said to me at the start of the year that more than 67,000 would roar on the England team at Wembley I'd have called for help. "What matters now is what happens next. "I do not think the London Olympics has delivered anything on legacy. I just don't see it - I certainly do not see any of my children's classmates taking up athletics or any other sport because of what inspired them during the Games. "Rugby league has to get it right."